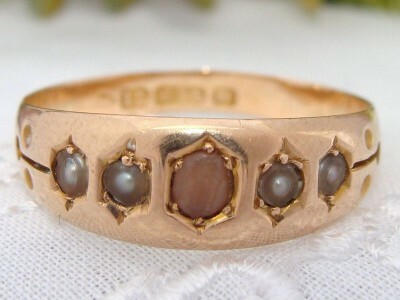 This is a Fabulous, Antique ring that feels wonderful on the finger. It combines natural gems, coral and pearls, simply yet elegantly. The pictures provide the best description. It looks lovely on with that soft yellow Gold hue with a hint of pink that is so highly sought after today. Nearing Mint Antique condition! It is clear it was worn little since it has little wear evident – the hallmarks are crisp and easily legible. It is resizable, if desired.